Going to the dentist regularly, you hear the same thing from your dental hygienist and dentist—make sure to brush twice a day, as well as floss twice a day. As most of us complete the former to combat the inevitable bad breath resulted from ignoring it, flossing is sometimes extremely overlooked. Yes, it may add about five extra minutes into your routine, but flossing your teeth has immense health implications. At Meadowbrook Dental Care, we are dedicating to creating and maintaining beautiful smiles, while delivering the best quality of care to our patients. We provide you with comfort, safety and satisfaction when you come in for your annual dental care, but also want you to be a proactive part of maintaining a healthy and beautiful smile. Flossing is an important way to accomplish this. In this blog post, we’re going to explore the importance of flossing and it’s influence on your overall health. First, let’s look at how many times a day you should floss. The American Dental Association recommends flossing your teeth once a day. There is no optimal time in flossing, as some people do so before brushing and others do so afterwards. Find your flow and incorporate flossing into your routine. A major impact from not flossing your teeth includes the inevitable plaque and bacteria buildup. Flossing is a crucial practice in removing bacteria between your teeth and fighting against the potential of gum disease. Gum disease is the result poor dental hygiene and results in swollen and red gums. As I’m sure you know, bleeding as a result of brushing is not a healthy thing. This can be the result of unhealthy gums, and flossing is an essential practice to maintain the health of your gums. Furthermore, not flossing your teeth regularly can lead to a gum disease called gingivitis. Gingivitis can lead to very red and swollen gums that bleed easily and can result in tooth loss. Flossing removes food, plaque buildup, and bacteria that is lodged in between your teeth. This is an extremely hard task to accomplish while simply just brushing your teeth, hence why flossing should be utilized. Tartar buildup can occur, making it extremely difficult for you to remove on your own. This requires the methods provided by your dental hygienist to really work to get the tartar buildup removed. We love to see you come in for regular hygiene checkups, but tartar buildup is not a sight we enjoy to see and want you to be proactive in taking care of it. There are other adverse effects from not flossing that you may not realize. Not flossing can lead to your teeth becoming yellow more quickly. Though we offer a variety of teeth whitening services, you can do some proactive measures to help maintain a healthy, white smile. Neglecting to floss can also lead you to suffer from something called halitosis, commonly known as bad breath. Instead of combating bad breath with countless packs of gum and tic-tacs, the act of flossing can help you rid the bacteria, that becomes sulfur compounds, and causes a foul odor. When it comes to maintaining dental health and fighting against tooth decay, flossing is a powerful force to be reckoned with. 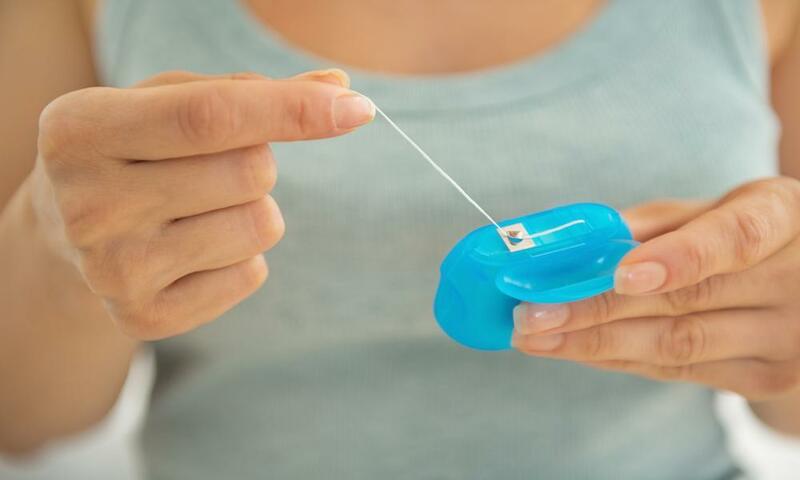 The simple practice of flossing once-to-two times a day can result in much healthier teeth maintenance, less gum bleeding, a whiter smile, and an overall healthy smile. It is an easy routine to implement into your daily life and can have immense benefits on the overall health of your teeth and body. It is an essential practice in maintaining your teeth. Meadowbrook Dental is dedicated to providing you with a healthy mouth and beautiful smile through our proper oral hygiene and continuing care for your dental needs. We do our end in helping you keep your teeth clean, but you must also have an active role in doing so as well. Flossing your teeth can have a serious positive impact on creating and maintaining a healthy, beautiful and white smile. To schedule a routine dental visit, or to receive some of our cosmetic, general, and specialized dentistry services, visit our webpage today to see what Meadowbrook Dental Care can do for you!